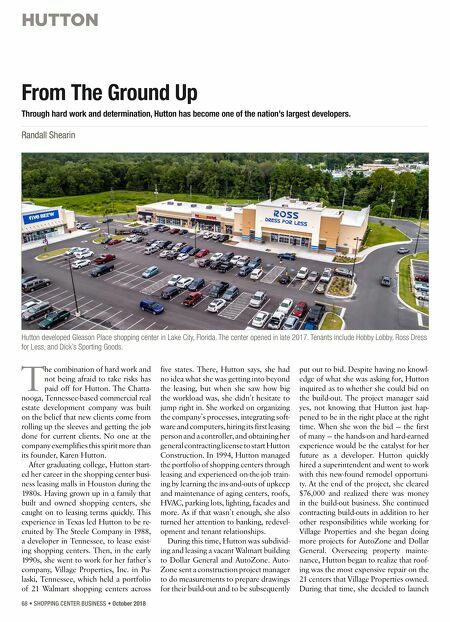 HUTTON October 2018 • SHOPPING CENTER BUSINESS • 69 a roofing company to repair and replace commercial roofs that is still in business today. After five years of working togeth- er, Hutton and her father parted ways — on good terms — in the mid-1990s. "He gave me the advice, to my surprise, to go do my own thing," she says. "I was committed to the job while I was commut- ing 115 miles each day, so the parting was a surprise, because I gave it my all. Within one month, I had set up shop in a spare room in my Nashville condo, which I still own and lease today. I searched and hired superintendents shortly thereafter and officially made Hutton Construction my sole focus." For several years, Hutton remodeled spaces for AutoZone and Dollar Gener- al locations. The relationship built with Dollar General, and a friend who knew of an opportunity, got Hutton a seat at the table to discuss a new fee development program being launched by Dollar Gen- eral. Selected as one of five developers, Hutton was given the challenge to devel- op in Texas. The deals started slow — most areas of the state were too far from Dol- lar General's closest distribution center in Oklahoma. She only figured this out later and realized she was provided the smallest of opportunities at the time. But Hutton remained determined. She spent most of her time working tireless days and nights driving the Tex- as markets for site selection, receiving countless declines, living off her savings, www.envoynnn.com Reversible S/L Financing New nancing alternative a smarter way to monetize your real estate – without losing it forever. Free up capital and enjoy the exibility to repurchase your property. Great for companies that are going through transitions, or need time to set up long-term nancing. 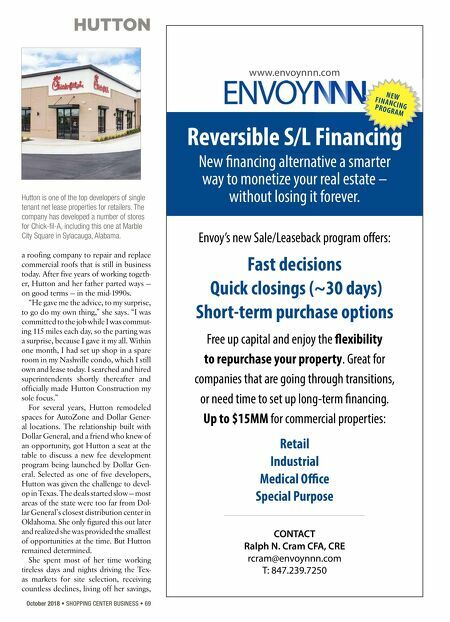 Up to $15MM for commercial properties: Envoy's new Sale/Leaseback program o€ers: Fast decisions Quick closings (~30 days) Short-term purchase options Retail Industrial Medical O„ce Special Purpose NE W FINANCING PROGRAM CONTACT Ralph N. Cram CFA, CRE rcram@envoynnn.com T: 847.239.7250 Hutton is one of the top developers of single tenant net lease properties for retailers. The company has developed a number of stores for Chick-fil-A, including this one at Marble City Square in Sylacauga, Alabama.